What we offer, as an independent agency, is access to all leading insurance companies in one place. We shop your insurance with all of the best insurers saving you time, rather than having to call around. We do NOT charge any fees for our services..
AAA, Allstate, GEICO, Mercury, Liberty Mutual , Safeco, Nationwide, Travelers, Progressive ASI, Nat Gen Premier, CHUBB, CSE, Kemper Preferred, Hartford, Nationwide Private Client, Farmers, State Farm, Met Life, Stillwater. Our goal is to provide you with the protection you want at the lowest possible price, while providing you with the highest level of customer service. We can furnish you with an assessment of your insurance needs and a choice of which package fits you best at the lowest possible price. It helps to find an agency that you know and can trust. Our Trusted Advisors have the knowledge and experience of our insurance products to provide maximum benefit and protection to our clients. Let one of our Trusted Advisors help you with your personal or business insurance needs today. Just check us out online to see for yourself all of the positive reviews we have accumulated over the years. We look forward to earning your trust and becoming your Trusted Advisor! Why do business with Thousand Oaks Insurance Agency? 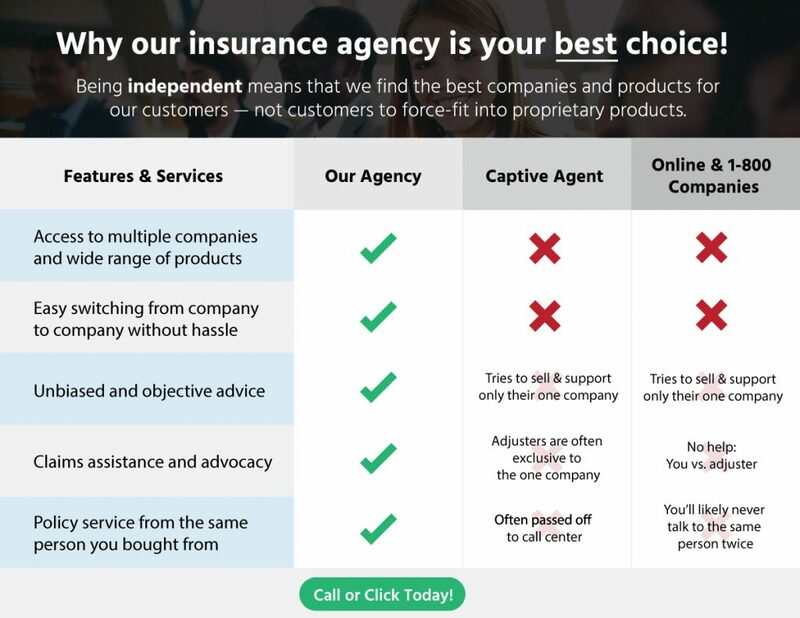 Unlike a captive, or direct insurance companies who only offer access one company, our agency is 100% independent of any one company. Many insurance consumers don’t fully understand just how important that really is. When it comes to something as important as insurance protection, it’s imperative that you work with a Trusted Risk Advisor with experience and in-depth knowledge of multiple insurance products, companies, and guidelines — not just one. What separates one agent from another, is their ability to proactively service their policy holders, and their knowledge of the insurance industry, products, and different situations that may present themselves to their clients. When you suffer a loss and need to file a claim is when we shine and we love helping our clients through these difficult times..